The Mondo is functional, fun, and handsome, and the tallest woven sisal cat scratching post available. It's legendary! The sisal scratching surfaces on The Purrfect View provide kitty with multiple angles and areas to scratch and stretch, as well as cuddle and snooze. The Purrfect Post is tall and sturdy, providing horizontal and vertical scratching surfaces to satisfy your kittes. Variety is the spice of life, so satisfy your cats' stretching and scratching urges with an inclined scratching surface. Why are these posts so Purrfect? Because we know what cats need AND want! Purrfect Posts are designed and produced by a veterinarian who understands cat behavior. Most posts are made without consideration for why cats scratch and how to provide for those needs. They are made out of the wrong materials and are too short and too unstable. Cats don't want to scratch short, fluffy, wobbly things. They want a strong, rough, and sturdy scratching post. Just like a tree! Each Purrfect Post is hand-made to strict specifications, ensuring the best possible post for your cat. Buying directly from the manufacturer allows you to have this superior product at a very reasonable price. Developed by a veterinarian who knows what cats need and want, all Purrfect Post products are designed to be cat-attracting, furniture-saving, cost-effective scratching solutions. Height: Your cat wants to stretch and pull all of the muscles in his or her back and shoulders when using a vertical scratching post. After all, in the wild, a primary "scratching post" is a tree! Purrfect Posts are tall enough for the biggest cat to fully stretch out against. Sturdiness and Stability: Think about that tree again: one thing is sure, it's not going to wobble or topple no matter how aggressively a cat digs into it to pull and stretch those muscles. If you have a wobbly post, your cat is not going to scratch it. Instead, a more stable option will be sought, putting your couch squarely at risk. Superior Material: Cats want a scratching material that shreds beneath their nails, leaving a visible scratch mark, cleaning the old husks from their claws, and allowing for a deep, smooth scratching motion. Sisal fabric, providing all of those characteristics, is a far superior scratching material to carpet or sisal rope, which catch cats' claws and pull on their toes. Cats love to scratch sisal fabric, making it the purrfect scratching post material. 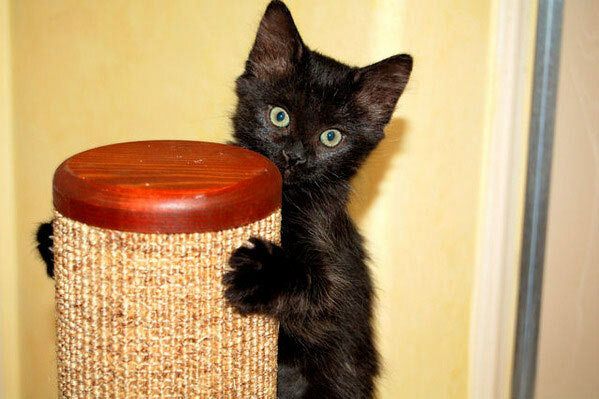 In order for your cat to use a scratching post, it needs to be in a prominent area of your house. A scratcher that is hidden away in a corner does not fulfill your kitty's need to mark territory. But if the post is ugly, you won't want to display it in the most high-traffic areas of your home. You'll hide it in an out-of-the-way spot, and your cat will end up ignoring it, going for your couch instead. Purrfect Post products have solid wood caps and trim and come in a variety of understated, classic colors, so you will be happy to display them in your house. Shopping for a Purrfect Post is like finding the perfect accent piece for your decor. A Purrfect Post won't be the ugly elephant in the room. Because most of our business comes from referrals, we made sure that we created a product that would make a great conversation piece. You will be able to proudly share with your friends that you found a quality, American-made product that works. "Inky fell in love with her PurrFect Post the minute she saw it when she was 8 weeks old. She's a year old now and she still loves it and uses it several times eaach day. We're so pleased that we got it for her. We had new leather furniture when we adopted her and we didn't want to have her de-clawed. We're all so pleased that we bought a PurrFect Post instead - and in the year we've had Inky, we haven't had one scratch on our leather furniture - or any other furniture. We love the PurrFect Post as much as Inky does." Why is Made in the USA Important? Manufacturing our product right here at home allows us to ensure excellent quality control and a superior product. Plus, we want to support our economy and local craftsmanship. Why Should I Buy Manufacturer-Direct? Buying your Purrfect Post directly from the manufacturer means you'll be getting a truly superior scratching post at an affordable price, without the costly middleman markup. WE ARE SOMETIMES ASKED: "CAN I BUY THIS POST AT A STORE?" The Purrfect Post is only available through this website, so you are assured of getting the lowest price possible and a product that is guaranteed to be made to our high standards. A comparable post purchased elsewhere would cost at least twice as much.